Hello internet, long time no see (again). I’ve had a pretty busy summer. One of the things I did was travel to the US to teach at the very first Greenwood Fest. It was pretty great. So great, in fact, that I only have one picture on my camera from it. The last stragglers at the end of ‘fest cleanup. That chap there trying to hide behind his beard is Peter Follansbee. You might have heard of him. He did a lot of blogging about the event, you can find it all here. I spent quite a while with Peter and Jögge about choice of timber. 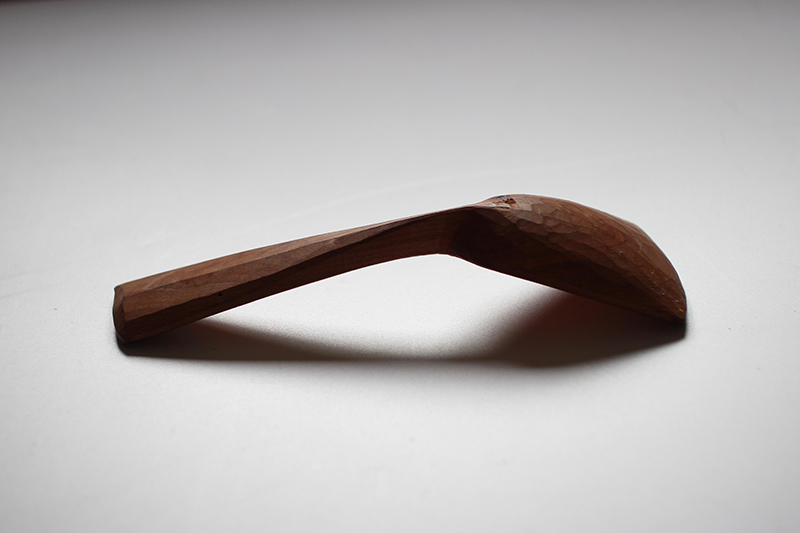 For some crazy reason, Peter seems to take pleasure in carving the twistiest hardest bits of fruitwood he can find. Whereas I just LOVE my nice, clean, straight birch. So a couple of weeks later, back home sorting through the woodpile, I come across a couple of twisty bendy pieces of damson. 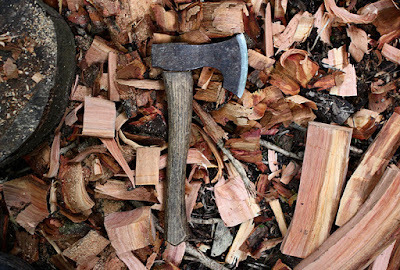 Rather than throwing them on the firewood pile, as I probably should have done, I thought…. oooh, maybe there are some spoons in there? And maybe I could blog about them?! And now here we are. Look what you’ve made me do, Follansbee. Pictures don’t do it justice, but the colours were GORGEOUS. 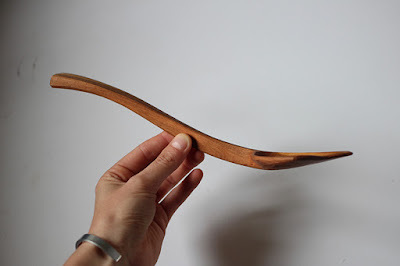 It’s always the colour that seduces me into carving fruit wood. I think “oh it’s so PRETTY!”, decide to carve something, remember how much hard work it is, curse a lot, and swear to never do it ever again. With Follansbee in mind and some wacky twisty bits of wood, I set to carving. This one with a lefty bias. 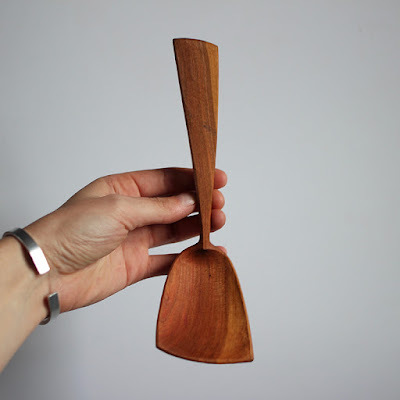 That spoon you never knew you needed, for serving things round corners? There are a few more still in various stages of completion. Now that I’m home I have some time for carving, so they might even get finished and onto the website sometime soon! And then I’ll never carve damson ever again (til next time). There are also a few more blog posts in the works, so keep an eye out.. So recently facebook memories reminded me that I wrote this blog post three years ago.. Cue the trip down memory lane! It’s old and the picture is a bit pants but it’s still pretty special. What a gorgeous patina! Three years ago marks two special occasions. It was the year I seriously got into spoons. Growing up in a house full of talented craftspeople means I’ve always used tools, and also used wooden spoons. But as a child I was far more interested in shorter projects. Mostly spears and swords to stab my little brother with! The spoon bug didn’t catch me until later. It also marks the year I first went down to Mike Abbott’s woodland chair workshop to work as an assistant. I couldn’t go away from home (and the spoon collection!) without a spoon of my own, so I grabbed on out of my little pile and stuck it in my pocket. Three years later and pocket spoon still lives in my pocket. It’s been on quite some adventures. It’s travelled with me all around the UK, from fancy restaurants to numerous woodlands. 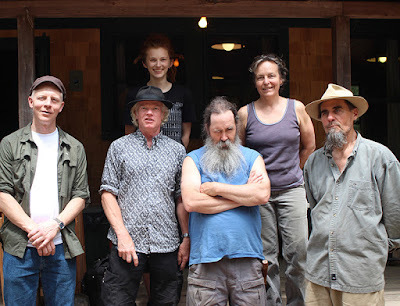 It’s been over to America to build a birch bark canoe and visit North House Folk School, over to Sweden to their craft school Sätergläntan, and more recently over to France to a beautiful little festival in Brittany. All adding to this beautiful patina. I LOVE the big bold facets on the back, and how the patina accentuates them. It’s part of the reason I love finishing my spoons straight off the knife – they just age SO beautifully. 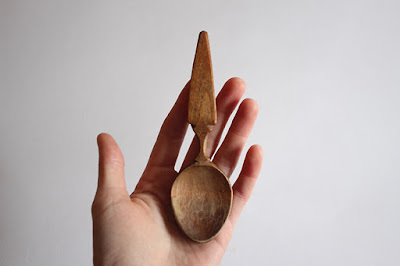 I’ve a lot of fantastic spoons by fantastic makers in my collection, but none of them are as precious to me as pocket spoon is. It still stands up next to my spoons today as a damn good spoon. 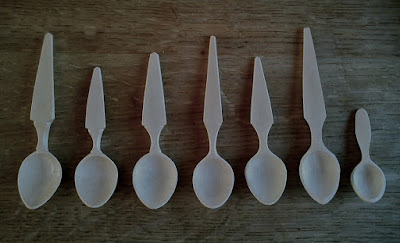 I found a lot of personal breakthrough and development while carving this collection of spoons. They’re truly seminal pieces. So pocket spoon is crammed full of memories, both of the time I was making it and everything that’s happened since. I love having pocket spoon with me. 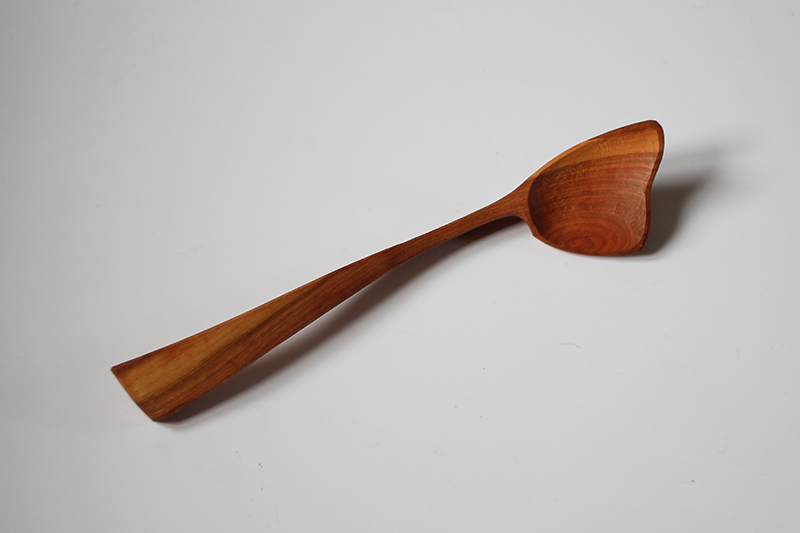 Every wooden spoon lover should carry a spoon with them. Have you ever had to buy some food while out and been given a nasty plastic fork to eat with? It’s a horrible experience. 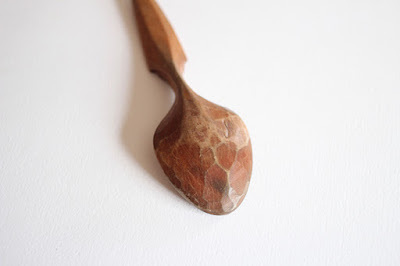 And an easily avoidable one – carry a nice wooden spoon with you!